U.S. 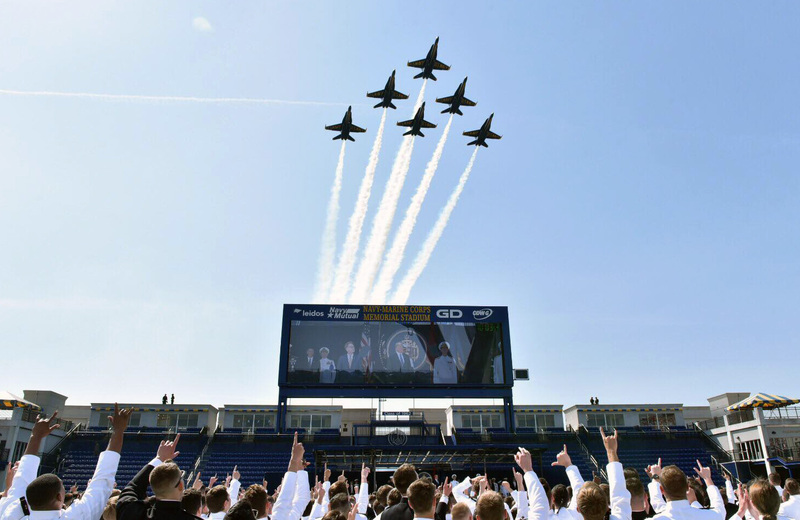 Naval Academy midshipmen from the Class of 2018 toss their covers in the air during the graduation and commissioning ceremony at Navy/Marine Corps Memorial Stadium. 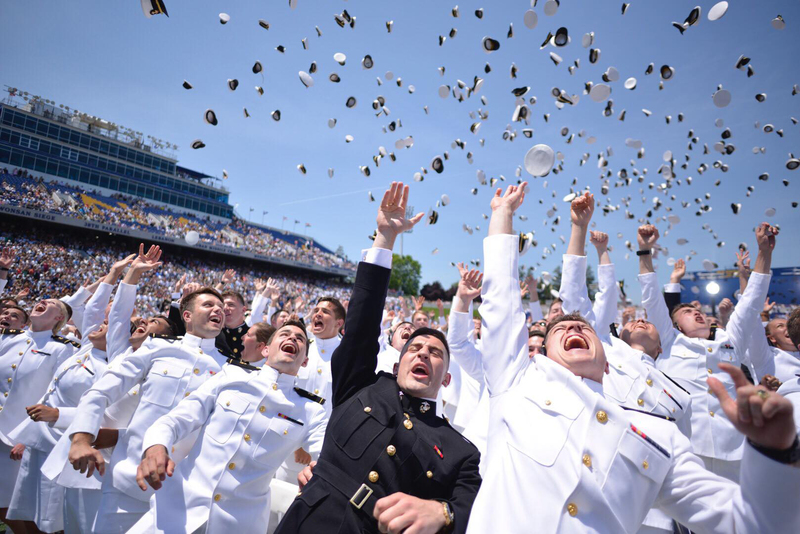 The Class of 2018 includes 303 women (25%, the largest number ever) and a total of 402 minority midshipmen (34%) out of the total 1,192 midshipman in the Class of 2018. The Class of 2018 has candidates who accepted appointments from all 50 states, the Virgin Islands, Puerto Rico, Guam and 13 international students from: Cambodia, Cameroon , Federated States of Micronesia , Georgia, Kazakhstan, Mexico, Montenegro, Nigeria, Republic of Korea, Senegal, Taiwan, and United Arab Emirates. US Navy photo. “The Soviet Union had no choice but to retreat and eventually collapse into the annals of its own inglorious past,” Modly said. Today’s military is charged with protecting U.S. interests around the globe, including spreading “the guiding lights of individual liberty and human dignity,” Modly said. “Weakness in pursuit of such lofty aspirations invites aggression, and it always will,” the undersecretary added. Before offering a final congratulations, Modly offered a bit of advice, honed during his years in the Navy and then in the business world at Price Waterhouse Cooper as the managing director of the national security practice and the Global Government Defense Network leader. “Don’t ever worry about being loved for what you do; rather, love the country you’re asked to defend. Love the Constitution you’re about to pledge your lives to protect and defend. And most importantly, love the people you have been privileged to lead. “Make sure they eat before you do. Care about their families as much as you do your own. Be invested in their successes more than your own accomplishments, and nurture their careers more than you pursue your own individual advancement. Value their lives to the point you will always consider their safety and security in every decision you make. And you will do this best by making sure they know how to fight and how to win,” Modly said.